I received an email from Nordstrom this morning introducing a new fragrance by Marc Jacobs, named Honey. I remember coming across an article from WWD a few months ago (maybe May) about this, and I was so excited about it because of the name 😉 of course it became less of a priority, so I forgot about it until today. 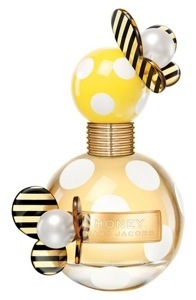 Long story short, for those who haven’t been updated, the whimsical and vibrant fragrance Honey by Marc Jacobs was officially launched exclusively at Sephora in July, then Bloomingdales in August, followed by the rest of other department stores in September, thus explaining Nordstrom’s announcement. It looks so bright and fun! Just looking at the bottle makes you feel happy & good inside. I may stop by Nordstrom to check it out. Although I am usually a fan of muskier and sweeter fragrance, rather than the floral and fresh scent, I just might give it a try and have date with Honey.